Thank you Gary for taking the initiative to do this. 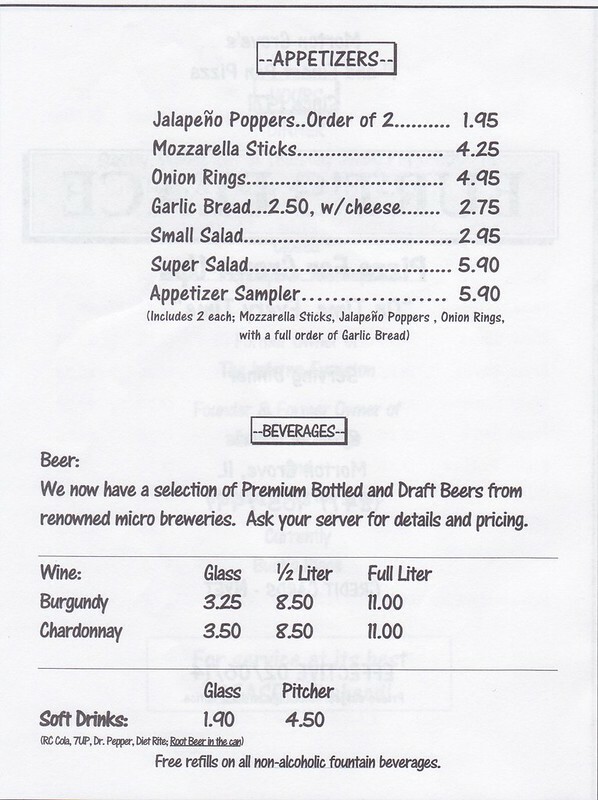 It should be noted however, so that someone doesn't read this older version of the menu and wind up with yet more disappointment, that Burt has pared down the menu to just pizza, salads, garlic bread, and appetizers. Because of prep time issues, he has eliminated the entire lower left hand side of the menu; which includes the pastas and burgers. Also to be noted, in addition to the selection of Great Lakes Brewery beers, he is now carrying The Alpha King, made by Three Floyds. Again, thanks for making this available. 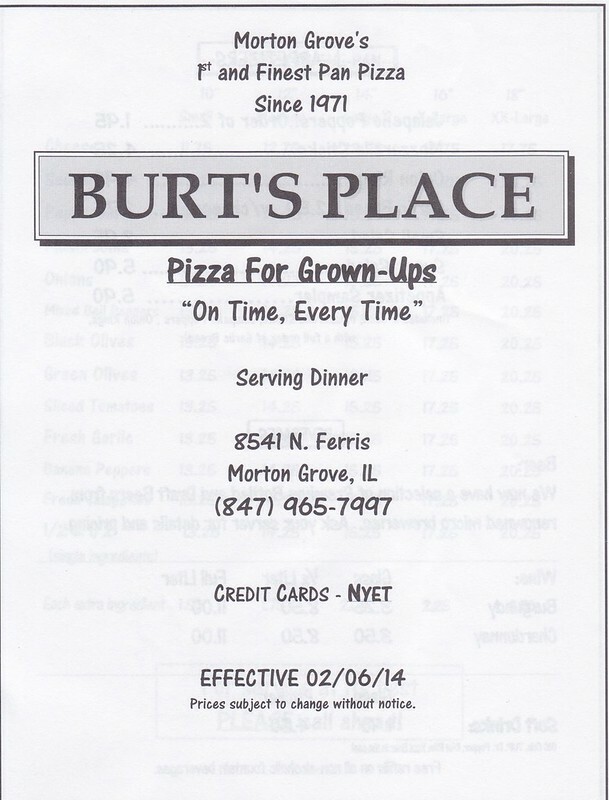 I made the changes, but it should be noted this is not meant to be the official Burt's Place web site, simply a convenience for pre ordering Burt's pizza and basic information. Completely understood and appreciated as such. haha GWIV, i think you an steveZ went ahead and built Burt his website! FYI Burt's will be closed October 20 to 28, and will reopen Wednesday, October 29. And please remember to wish Burt and Sharon a happy 25 years at Burt's Place! As a FYI - last time we were at Burt's the group at the booth next to us ordered a spinach and mushroom pizza. We didn't know he offered spinach because it wasn't on the menu. We love spinach pizza so next time, we're getting that! Spinach was inadvertently left off the last menu printing. Future versions will include it as an ingredient. 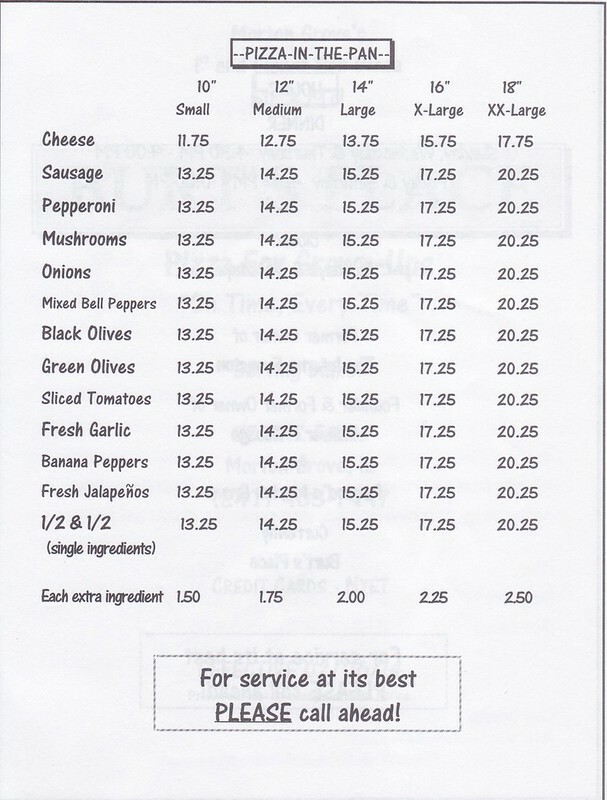 BuddyRoadhouse wrote: Spinach was inadvertently left off the last menu printing. Future versions will include it as an ingredient. No apologies necessary-I was excited to think I had a secret ingredient! 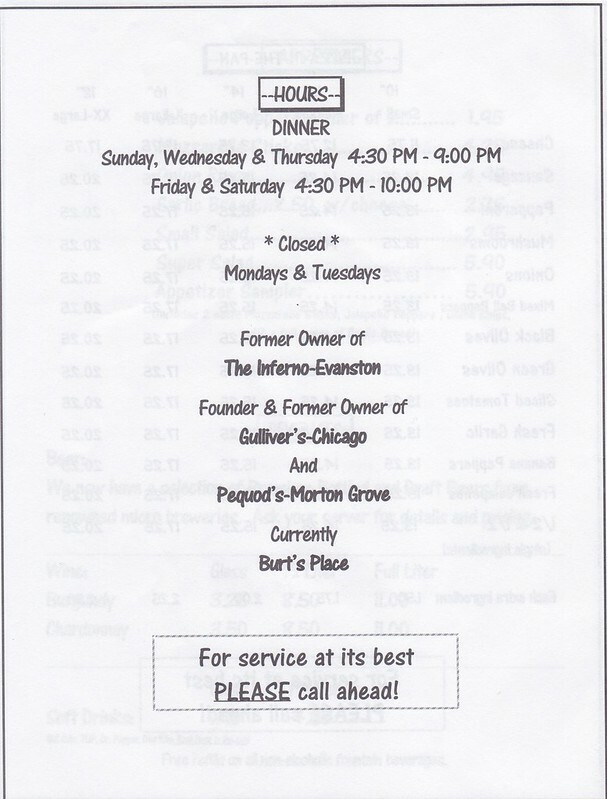 One of the last Yelp NW suburban dinners which I attended was to Pequod's Pizza, a stone's throw from Burt's Place. Dual bottom line: I won't make any more appointments for myself & my dad at Burt's Place; but this forum should make an appointment for dinner @ Burt's Place. Period. I'm unsure how much into 2015 my dad will live, and I'm equally unsure how much into 2015 Burt's Place will go, considering Burt's age. There was one interruption in the restaurant's operations a year ago. Schedule something for here damn soon. Last edited by pudgym29 on December 20th, 2014, 1:17 am, edited 2 times in total. I have a slight recollection of the incident. My main concern was that your Dad was okay. Sorry he wasn't able to make the trip inside; we would have taken good care of him. Also sorry his time on Earth is winding down. I'm very close with my Dad, and although he's healthy for his age, at 84, I know it can't last forever. Cherish every Pizza, from Burt's or otherwise. This seems like the best place to alert the LTH masses to an upcoming Food Network show featuring Burt and his Place. "America's Meals of a Lifetime" airs this Friday, December 26th at 9:00pm. The show presents 10 restaurants Food Network considers "bucket list worthy". They've somehow put Burt's in the same category as Antoine's of New Orleans and the French Laundry. Pretty crazy, I know. But I can assure you, no one would find it more ridiculous than Burt himself--that is, if he knew what The French Laundry was. I saw "American Meals of a Lifetime" tonight on demand. It's one of the better segments on Burt's that has ever aired. He's in some good company, too. It's actually a pretty good list of places, as these things go. They did a nice job of choosing great places across the whole spectrum of culinary greatness. A little something for everyone.